// From Appendix E. Table 1, JIS0510X:2004 (p 71). The table was double-checked by komatsu. // Type info cells at the left top corner. // From Appendix C in JISX0510:2004 (p.65). // penalties twice (i.e. 40 * 2). // vertical and horizontal orders respectively. // Found five repetitive cells with the same color (bit). // We‘ll give penalty of 3. NumSameBitCells := 1; // Include the cell itself. NumSameBitCells := 0; // Clear at each row/column. // The value must be zero or one. // First check if all version are not uninitialized. // Then check them in other ways..
// See 7.3.1 of JISX0510:2004 (Fp.5). (FMatrix.Width = FMatrix.Height)); // Must be square. // multiple modes / segments even if that were more efficient. Twould be nice. // Use that guess to calculate the right version. I am still not sure this works in 100% of cases. // Terminate the bits properly. // Interleave data bits with error correction code. 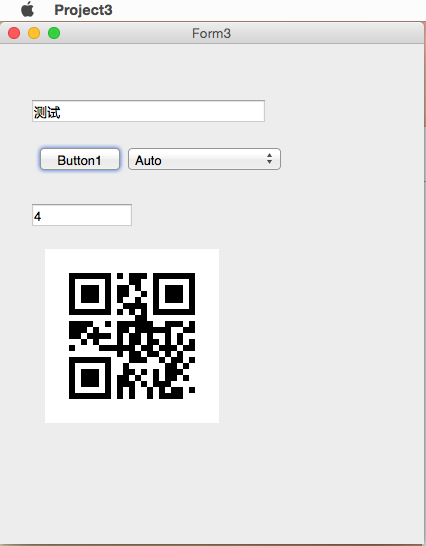 // Choose the mask pattern and set to "qrCode". 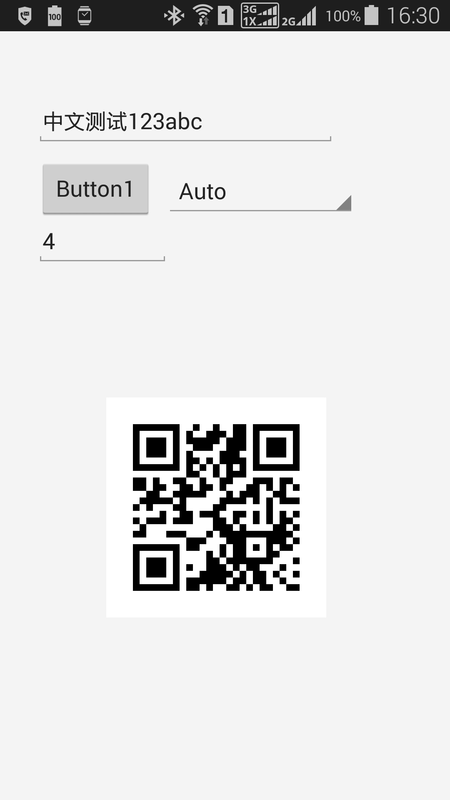 // Build the matrix and set it to "qrCode". // -1 if there is no corresponding code in the table. // We try all mask patterns to choose the best one. // Terminate bits as described in 8.4.8 and 8.4.9 of JISX0510:2004 (p.24). // Append termination bits. See 8.4.8 of JISX0510:2004 (p.24) for details. // If the last byte isn‘t 8-bit aligned, we‘ll add padding bits. // If we have more space, we‘ll fill the space with padding patterns defined in 8.4.9 (p.24). // 5 = 4 + 1. // "result". The interleave rule is complicated. See 8.6 of JISX0510:2004 (p.37) for details. // "bits" must have "getNumDataBytes" bytes of data. // store the divided data bytes blocks and error correction bytes blocks into "blocks". // Since, we know the number of reedsolmon blocks, we can initialize the vector with the number. // First, place data blocks. // Then, place error correction blocks. if (NumTotalBytes <> Result.GetSizeInBytes) then // Should be same. // Append mode info. On success, store the result in "bits". // Append length info. On success, store the result in "bits". // Append "bytes" in "mode" mode (encoding) into "bits". On success, store the result in "bits". // Encode three numeric letters in ten bits. // Encode two numeric letters in seven bits. // Encode one numeric letter in four bits. // Encode two alphanumeric letters in 11 bits. // Encode one alphanumeric letter in six bits. // success, store the result in "matrix" and return true. // Type information appear with any version. // Version info appear if version >= 7. // Data should be embedded at end. // Embed basic patterns. On success, modify the matrix and return true. // Let‘s get started with embedding big squares at corners. // Then, embed the dark dot at the left bottom corner. // Position adjustment patterns appear if version >= 2. // Timing patterns should be embedded after position adj. patterns. // Embed type information. On success, modify the matrix. // Type info bits at the left top corner. See 8.9 of JISX0510:2004 (p.46). // Embed version information if need be. On success, modify the matrix and return true. // See 8.10 of JISX0510:2004 (p.47) for how to embed version information. Exit; // Don‘t need version info. BitIndex := 6 * 3 - 1; // It will decrease from 17 to 0. // Place bits in LSB (least significant bit) to MSB order. // Embed "dataBits" using "getMaskPattern". On success, modify the matrix and return true. // For debugging purposes, it skips masking process if "getMaskPattern" is -1. // See 8.7 of JISX0510:2004 (p.38) for how to embed data bits. // Start from the right bottom cell. // Skip the vertical timing pattern. // Skip the cell if it‘s not empty. // in 8.4.9 of JISX0510:2004 (p. 24). // Skip masking if mask_pattern is -1. Direction := -Direction; // Reverse the direction. Dec(X, 2); // Move to the left. // All bits should be consumed. // code is used for encoding type information and version information. // Example: Calculation of version information of 7. // f(x) is created from 7. // operations. We don‘t care if cofficients are positive or negative. // from 13 to make it 12. // Do the division business using exclusive-or operations. // Make bit vector of type information. On success, store the result in "bits" and return true. // JISX0510:2004 (p.45) for details. if (Bits.GetSize <> 15) then // Just in case. // Make bit vector of version information. On success, store the result in "bits" and return true. // See 8.10 of JISX0510:2004 (p.45) for details. // Check if "value" is empty. // separation patterns (size 1). Thus, 8 = 7 + 1. // We know the width and height. // C/C++. We should live with the fact. // Embed position detection patterns and surrounding vertical/horizontal separators. // Embed three big squares at corners. // Embed horizontal separation patterns around the squares. // Embed vertical separation patterns around the squares. // Embed position adjustment patterns if need be. // If the cell is unset, we embed the position adjustment pattern here. // it) but there is no problem since 0 XOR 0 == 0. // In the following comments, we use numbers of Version 7-H.
// Leading term must be non-zero for anything except the constant polynomial "0"